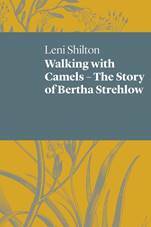 Walking with Camels – The Story of Bertha Strehlow by Leni Shilton is a gorgeous, subtle rendering of the both brutal and starkly beautiful Australian desert, and those relationships that exist and are formed within this landscape. Shilton’s verse novel charts Bertha Strehlow’s transformation from a naïve and shaking girl, determined to follow the man she loves into unknown territory against the advice of loved ones, into a woman possessed, damaged and strengthened by the desert. Shilton’s rigorous research, bolstered by found poems and historical and biographical notes, grounds the poems in a moving reality, filled equally with suffering and joy. Shilton’s depiction of the vast landscape, with its towering magnitude, emerges as counterpoint to the simple minutiae of daily life. Poems such as ‘The Silence’ and ‘Poetry Reading’ evoke the vast brutality and emptiness of the Australian desert, and Bertha’s pervasive feelings of isolation and smallness. The map Bertha follows forms ‘a pattern of unfamiliar marks / across vast spaces’ (14), and ‘All our walking / in ‘undiscovered country’ / becomes discovery of / emptiness, / silence’ (36). Bertha herself appears a tiny figure, but one that continually creates her narrative against and through this landscape. Shilton crafts the desert as indelible, marking and capturing Bertha forever, even through the process of dissolving their relationship. Naturally, Ted himself and their shared experiences also prove to be somewhat indelible. Music dances softly through this verse novel, as explicit subject and implicit thread; it draws the points of past and present close together, links husband and wife and later eviscerates the space of loss. Two poems are titled ‘Gramophone’ – the first describes a dance between Ted and Bertha, his murmurs of ‘coloured dreams’ that drew her away from everything she knew (27), and the second, the final poem of the collection, details Bertha’s savage loss and grief in the desert and as the consequence of her separation from Ted. There were ‘four babies lost to the desert / three who stayed’ and Bertha’s sad yet sanguine voice explains that though ‘she prayed our children, the adventure / would hold him to me’, ‘his dream took in more than desert’ (112). Following Ted’s betrayal and departure, Bertha must ask her son to turn off the gramophone, because the memories it dredges up, of ‘songs of Central Australia’ and of a time ‘when I thought his love / and God’s love was all that was needed’, are too painful for her to bear. Though Bertha has survived the desert, she never escapes it; Shilton inscribes this enduring grief in the simplest of phrases – much like the dust and the flies in the desert, Bertha’s grief and loss are an inseparable element of her life’s landscape. If I call, will he hear me? The miscarriage itself marks a turning point in Bertha’s life; faced with mortality, and surviving to birth again, Bertha gains a fierce strength. Shilton uses ‘I speak from under the earth’, the only prose poem in the novel and a stark slab of text, to mark this transformation, in addition to the absolute and immovable nature of the experience. The words here bubble over, like a tidal wave filling the horizon, and bespeak her new connection with the sky, the wind, the birds, dingoes, ants and stars, but most of all with the desert itself, which ‘is its own animal, alone and desperate’ (65). Ted and Bertha’s relationship in fact seems to wane as Bertha’s intimacy with the desert waxes. Dr Sarah Pearce is an emerging performer, poet, writer and academic from Adelaide, South Australia. Her work has appeared in Aeternum, Outskirts, Meniscus and Writing from Below, and she has occupied residencies at the Adelaide City Library and FELTspace gallery. She writes about embodiment, love and those ways in which we relationship with each other.